5. A custom rear rack for the fatbike. Through the day I try and get in touch with a friend who had kindly offered me a place to stay. But my calls and messages go unanswered. I am in Mumbai with no backup plan, on a strict budget and no hotels that fit my thrifty budget. I decide to bivouac at the train station as I don't have anywhere to go and await my host's call if it comes. Come late evening I find a quiet corner on the platform along a bench and settle in for the night. I am not carrying my sleeping mat and the hard concrete is not easy on the back. Thankfully I have a roof over my head as it rains for an hour. I doze off for a while before I am woken up by a patrolling policeman. He does not appreciate my appropriating a public place. After hearing my predicament and a lot of questions later, I finally convince him that I have no evil intentions and he lets me linger. The next evening my friend calls and I have a place to stay and unload for the night. The bike arrives on the 3rd and I spend the day putting it together. Varun (from FitTrip Bikes) & I have made a few important changes from the stock version and I want to make sure that everything goes in the right way. This is also my first experience riding a fatbike. 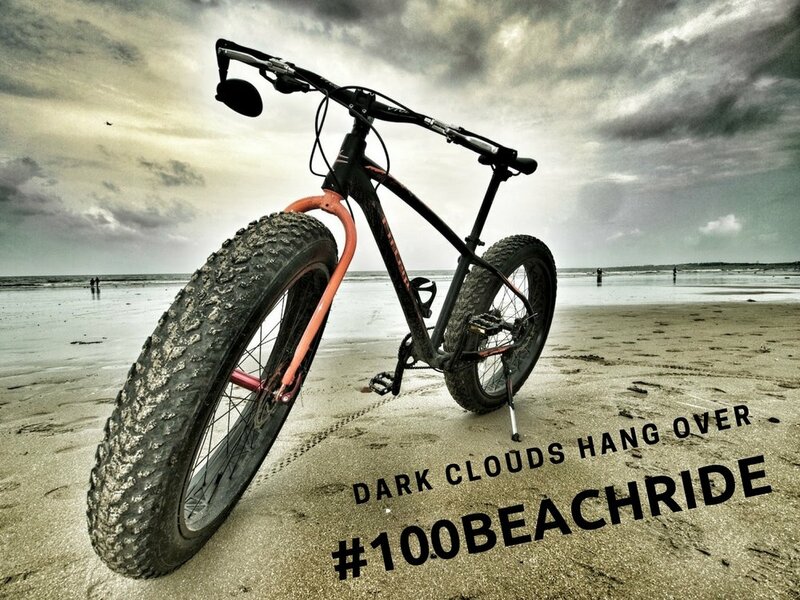 Till now I had only read about this mythical beast and how people around the world were rediscovering the fun of cycling all year on terrain like snow and sand, courtesy a fatbike. I spend the next few days riding the fatbike around Mumbai. Yet, nothing that I had read prepared me for the attention that I get in Mumbai while riding a fatbike. People shout out to me on the streets, heads pop out of autos, people swerve cars in front of my bicycle. Questions, comments ... compliments. I would have got less attention if I had been cycling naked, I reckon. Just when I was getting the hang of the bike and the city, I get an urgent phone call from my best friend. His father has suffered multiple organ failure and needs to be moved to a New Delhi hospital. He doesn't say it, yet I reckon he could use an extra pair of hands at the hospital. I still have loads of gear with me and a bicycle that is not exactly inconspicuous. I need a safe place to store the bicycle and gear for the time I am in Delhi. Thankfully, another friend kindly agrees to host me for a few days and store my bicycle and gear in Bandra. Thank you, Aditi & Kapil. After another 16-hour train journey, I am back in Delhi. I find hospitals to be depressing, but I am glad to help my friend with what I can. Every morning I commute to the hospital, spend the day there helping what I can and am back at night to get some much-needed sleep. Fortunately my friend's father shows signs of improving and the doctors are confident he is out of immediate danger. This means I can plan going back to Mumbai. It's already a week past our planned starting date and retreating monsoons should be making their way back to the Maharashtra coast. I am back in Mumbai again, and again the Chair Car is the only train ticket I can score at such short notice. This uncomfortable chair is starting to feel like home now. I pick up my gear from Kapil's place and head over to a Bed & Breakfast I had booked at the last moment, getting wet in an evening downpour. That night as I work on finalising my stops along the #100BeachRide I notice that my throat starts to feel a bit itchy. This does not bode well is the last thought in my head as I fall asleep, fervently hoping it's just a bad throat. The next day I wake up with a 101 fever. For the next couple of days, I am confined to bed, sweating with the high fever. Finally on the third day I start to feel better and I can think about starting the trip again. It's almost the end of August now and the weather department has sent out a weather alert expecting heavy rain in Konkan over the next week. However, I am left with no choice, I have to start this trip before I give into the voice in my head that tells me "this trip is jinxed and you should abandon it".